The Aroostook Agency on Aging will be starting the year 2019 in new headquarters at a larger space on Main Street in Presque Isle, with plans for new programs and technology that will boost its mission of helping older people live well and independently. PRESQUE ISLE, Maine — The Aroostook Agency on Aging will be starting the year 2019 in new headquarters at a larger space on Main Street in Presque Isle, with plans for new programs and technology that will boost its mission of helping older people live well and independently. “We’re very excited. It’s in the works,” said Joy Barresi Saucier, executive director of the Aroostook Agency on Aging. The nonprofit agency serving older and disabled individuals in Aroostook County plans to move around the first of the new year from its current headquarters on Edgemont Drive near the Skyway Industrial Park to a part of a plaza on Main Street that has largely been vacant in recent years. Barresi Saucier said the agency will be transitioning to its new space as renovations there finish up and plans to be fully open by the end of March. The total cost for renovating the new space and acquiring new office furniture, equipment and technology will be approximately $221,000. The agency is in the midst of a fundraising campaign with foundations and individuals to cover about $161,000 of those costs. It’s also applied for a $50,000 grant from the U.S. Department of Agriculture Rural Development’s community facilities program to cover some of the costs of purchasing new videoconferencing technology. The new facility will have about 7,700 square feet and will roughly double the agency’s current office space, Barresi Saucier said. It will have private offices for consultations, rooms with videoconferencing technology, and a community and team room. The space at 260 South Main Street is being leased from R&L Real Estate LLC, formed in 2006 by Robert and Gregory Graves, and renovation work is being done by Buck Construction. 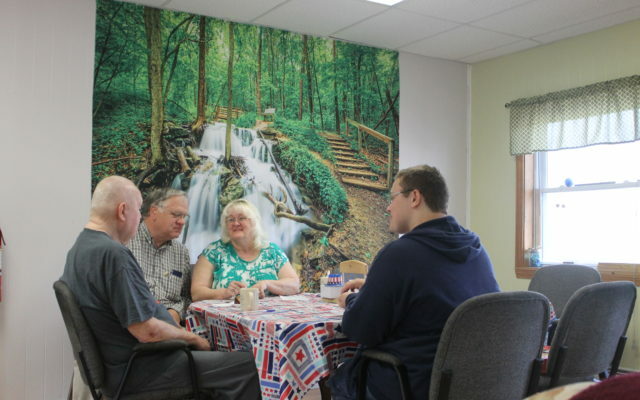 The Aroostook Agency on Aging also operates Gathering Place on Davis Street, the agency’s original headquarters that now hosts its adult day program and nutrition services. The new headquarters will offer better parking, accessibility, and visibility in the community, said agency board chair Rev. Ken Phelps. “This new place is much more suitable. It puts us out in the community, where the community can see us,” he said. Phelps and Barresi Saucier said that the new space will also help the agency grow its ranks of volunteers. Barresi Saucier said the agency currently serves about 5,800 senior citizens each year and has about 140 volunteers.